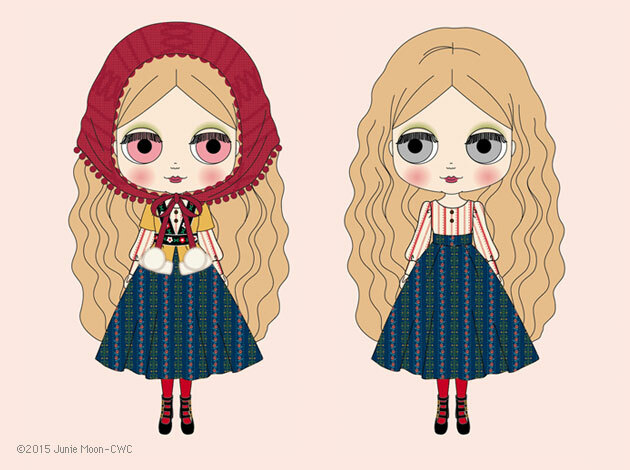 The latest Neo Blythe realised is called Winterish Allure with a russian folk inspired vibe. Her top is stripe stitched, and the skirt on her dress is printed with a flower pattern. The top is a mustard yellow vest with a flower patterned Tyrollean tape and a fur accent. During the cold months, she wears her favorite raspberry colored knit babushka. Her tights are red, and she also wears a pair of black four strap shoes. Her face type is Radiance+, and her face color is natural. Her eyeshadow is olive green and her cheeks and lips are a reddish pink, to give off a healthy feel. Her special eye chips are a dark blue and light grey for her front and left facing eyes, respectively. She has ash blonde hair that is parted down the center, with a gentle perm. Do you remember the 60s?